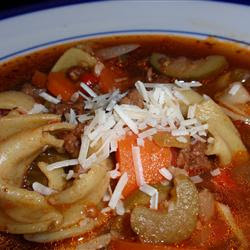 This is a really good vegetable tortellini soup, a bit like minestrone. This is the best soup recipe I've ever found. I use 1 lb. ground beef instead of the sausage, so I can't actually vouch that it's good with sausage! I use frozen tortellini because it's cheap. I cook it separately and add it right at the end so it doesn't soak up too much of the juice. I also substitute apple juice for the wine- because I usually have it on hand. Really good with a nice baguette. 1. Brown sausage in pot; drain off fat. Add onions and saute until tender. Add carrots, celery, beef broth, red wine, tomatoes, ketchup, Italian seasoning, and garlic. Bring to a boil and simmer for 30 minutes. Skim away the fat from the soup. 2. Stir in the zucchini, tortellini, red bell pepper, and parsley. (If you use fresh tortellini, cook them according to package directions.) Simmer, covered, for about 25-30 minutes or till the tortellini are tender. Season with salt and pepper. Sprinkle with cheese right before serving.